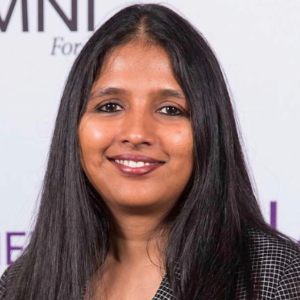 Shohini Ghose is a Professor of Physics and Computer Science at Wilfrid Laurier University and the founding Director of Laurier’s University Research Centre for Women in Science. She is a theoretical physicist who examines how the laws of quantum physics can be harnessed to transform computation and communication. She and her colleagues first observed a connection between chaos theory and quantum entanglement. She is the Vice-President of the Canadian Association of Physicists, and the first Canadian member of the Working Group on Women in Physics of the International Union of Pure and Applied Physics (IUPAP). She currently serves as Co-Editor of the Canadian Journal of Physics. She is the recipient of several awards including a TED Senior Fellowship in 2018. Dr. Ghose works as a Researcher and Equity, Diversity and Inclusion Specialist at the Perimeter Institute for Theoretical Physics. She is an Affiliate of the Institute for Quantum Computing, and a Fellow of the Balsillie School of International Affairs. In 2017, she was named to the Royal Society of Canada’s College of New Scholars, Artists and Scientists.